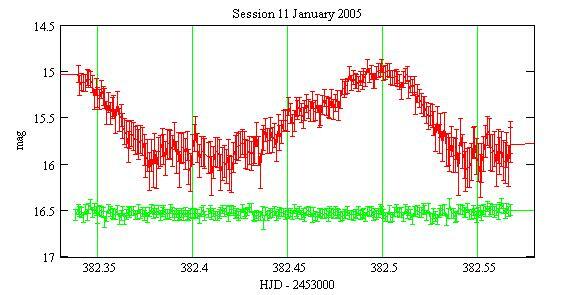 Light curves for this UGZ cataclysmic star are presented. CN Ori is a cataclysmic star, that is a binary star with an accreting white dwarf. The orbital period is 3.9 hours. It is classified as a UGZ dwarf nova, with outbursts every 18 days. The observations were carried out with a 203mm SC telescope, a Clear filter and a SBIG ST7E camera (KAF401E CCD). 711 images were obtained over 3 nights. Each exposure has a duration of 60s. The comparison star is GSC 4776-00527 with an assumed unfiltered magnitude of 12.700. 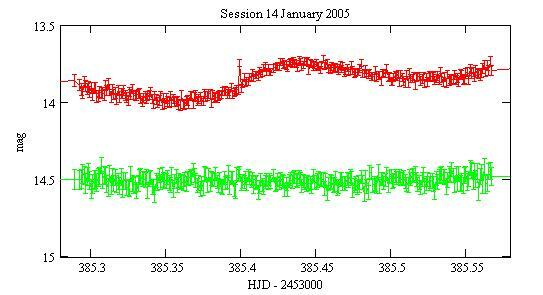 The check star is GSC 4776-00519 with a measured magnitude of 14.419 and a standard deviation of 0.036. A sample image with the field of view is here. 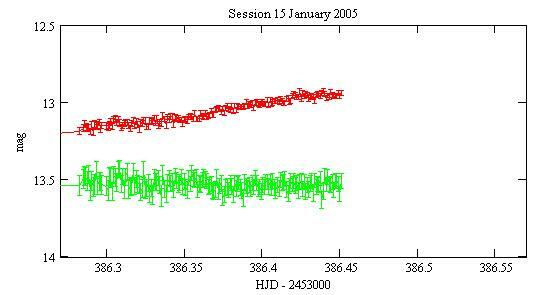 Red: CN Ori, Green: the check star magnitudes shifted by +2 mag. The error bars are the +/- 1-sigma statistical uncertainties. The check star magnitudes are not shifted. The check star magnitudes are shifted by -1 magnitude.